Home » blocks » One done! Here is my first Bead on a String block for February. 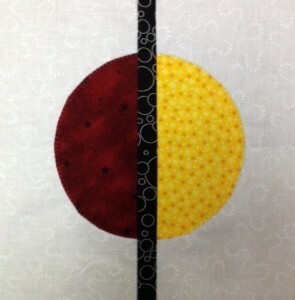 This is the first time I have used the freezer paper method for applique. Thank you Sophie for making me reach!! It was much easier than I thought it would be. I used spray starch to help fold the circle under which worked out very well. I have a third block almost complete which I will add to the other two sides of this and make the next two blocks. Hope to have all 9 blocks done over the weekend! On a side note: I’ve received 30 wonderful Double Chevrons in the mail. Sew much Fun!! Happy Friday from Marie in Snowy New Hampshire! For me, after I get past my fear of trying something new, it’s almost easier than I thought it was going to be. Your first attempt at freezer paper appliqué turned out great! Thanks for the update on your Chevrons. I think everyone is waiting for the last few blocks. Marie just a quick note to say thank you for your understanding and to let you know the Chevrons have been reposted… I was also wondering …Just what is freezer paper? I have looked for it in the stores and not had any luck. One clerk wondered if it wasn’t Wax paper? Your bead looks great and if you get 8 more done on the weekend you’ll have done well! Happy Days to You! the freezer paper method… is that the same as the Dale Fleming method?